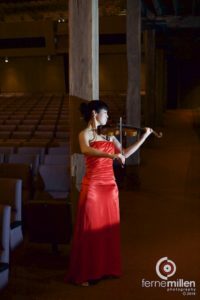 Two Romantics presented by Geelong Symphony Orchestra, conductor Richard Davis, soloist Rio Xiang. Costa Hall, March 2, 2019. Call it serendipity, happenstance, providence… Either way, it occurred to this critic at this concert. It really began on Wednesday, when I had surgery to remove a cataract and place a new lens in my left eye. By Saturday, I was seeing things with astonishing clarity and distinction. Not that that should have made any difference at the Geelong Symphony concert. This was, after all, showcasing the music of two great romantic composers, Brahms and Tchaikovsky. So it was to be a treat for the ears, not the eyes. But then we were handed tickets to the third row, front and centre which allowed a remarkably close-up view of the pre-concert string section. With my new enhanced vision, I saw things unnoticed before. Like concertmaster Olivier Bonnici’s cheeky mustard-coloured socks, Emily Frazer’s look of concentration as she led the warm-up, lead cellist Timmothy Oborne’s laid-back stance contrasting Jamie Parker’s total concentration; violinist Eve Gu’s beautiful black-lace shoes… Then guest conductor Richard Davis took the stage in full tail suit, white tie conflicting just a little with the GSO’s more relaxed outfits of men in dark lounge suits, women in black ensembles. Then the opening piece began. It was Brahms Academic Festival Overture Op. 80, and nicely suitable for Deakin University’s showplace hall with its themes of student drinking songs. It was presented in what is now the accepted GSO manner – neat, faultless delivery in cool professional style. Still I had no real inkling of what was to come as the Costa’s Steinway grand piano was moved centre-stage for the evening’s second piece of romance, Tchaikovsky’s Piano Concerto No 1 Op.23. 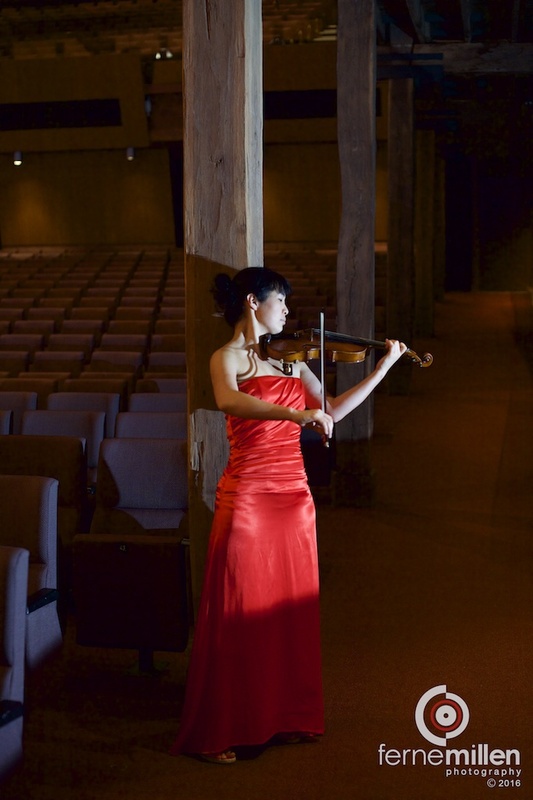 This was to be played by Rio Xiang, the young man who had won last year’s Youth Classical Music competition in Geelong, with appearing at this concert part of his prize. Rio is a tall, slender 20-year-old who appeared reserved, perhaps a little awkward as he took his welcome applause and sat at the piano. Conductor Richard Davis is, by contrast, an old hand. 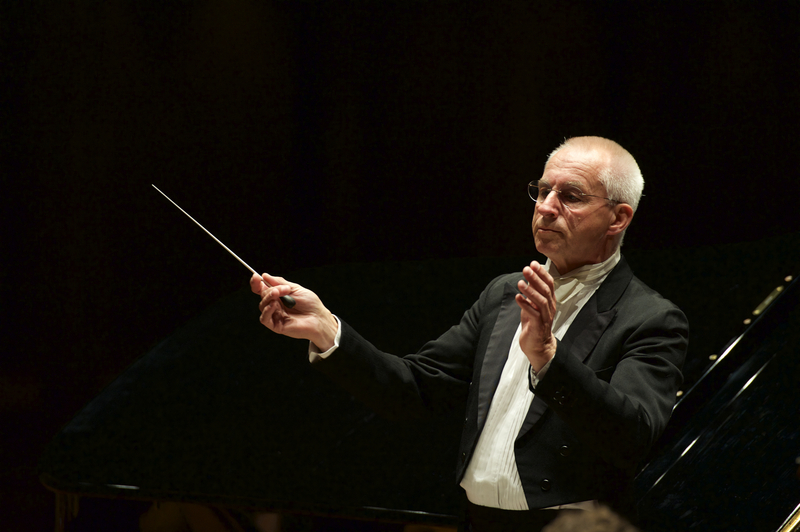 He’s chief conductor and head of orchestral studies at Melbourne Conservatorium and he regularly conducts orchestras worldwide including the BBC Philharmonic. He holds a top reputation for bringing the best out of orchestras and soloists, using a unique style of expressions, flourishes, smiles, frowns and gestures. As this is directed at the players, it’s usually unseen by the audience who would simply see the back of that elegant tail suit. Unless you happened to be in seat C30 in the Costa Hall, 2 metres away, in direct line of sight between conductor and soloist – and with newly enhanced vision. I can tell you this piece was enthralling. Illuminating. It was thrilling, compelling stuff, watching Rio’s pale long fingers dancing his keyboard for the 20-minute piece without sheet music while being wordlessly led, stimulated, encouraged by his conductor who twisted and turned to make eye contact while still in full control of the orchestra. I should also add that the music was wonderful, faultless – and that it drew long, loud applause and no fewer than four call-backs before the concert’s interval. The concert’s second half consisted entirely of Brahms’ Symphony No 1 in C minor Op. 68 in its four movements. There was no piano, no Rio, just gorgeous, flowing, soaring lush romantic music played with the GSO’s gloss, style and verve. But, for me, it was just a bit anticlimactic following that (literally) brilliant Tchaikovsky piece. I felt privileged to have been in that place at that time. So this concert redefined memorable for this critic, who now looks forward to hearing – and seeing – the GSO’s next concert, when the gorgeous Rebecca Chan plays all four of Vivaldi’s seasons. I just hope this vision enhancement doesn’t fade. Beethoven’s Ninth Symphony was his last, and it’s widely acknowledged as his greatest work. He was completely deaf when he wrote it, working the music out using mathematical patterns. On its Vienna opening performance, Beethoven sat beside the conductor, giving the tempo for each piece. At the end, the lead contralto singer had to turn him around to see the auditorium applauding. Knowing that he couldn’t hear them, many applauded by gestures and waving handkerchiefs. In Geelong, they gave it a standing ovation. 194 years later. It was something of a surprise to learn that this was the first time Beethoven’s Ninth had been performed in Geelong. That’s probably because the circumstances needed to create it – meaning a fully fledged, accomplished symphony orchestra and chorus with a leader and conductor with the knowledge and expertise to prepare them, along with a venue to accommodate them as well as an audience large enough to justify the expense – hadn’t come together before. But they did for this performance, and in remarkable style. For the evening had begun with the Geelong Symphony Orchestra in a more restrained role, behind piano soloist Stefan Cassomenos as he delivered Mozart’s Piano Concerto No 15 in Bb Major with the accomplished flair of a showman. Stefan is a vibrant and highly visual musician, whose concentration was such that he appeared to respect every note, even those he wasn’t playing, by the use of small nods, movements, even occasional Satchmo-like mopping of his brow with a flourished white handkerchief. But along with this, his skill delivering Mozart’s dazzling musical patterns and colours in the piece’s three distinct movements was superb. Enough to earn three curtain calls alongside elegant Maestro Fabian Russell, whose delicate control of his orchestra had supported and embellished every note. Then, after a 20 minute interval, the Costa Steinway was wheeled away and the stage was literally set for Geelong’s orchestra to take on Beethoven’s masterwork. There were 76 musicians under Maestro Russell’s baton, while high above in the venue’s choir gallery, was the newly-formed GSO Chorus. This comprised some 60 experienced singers drawn from at least five local choirs surrounding the evening’s four soloists. They were the delicately balanced and matched Lee Abrahmsen (soprano) Belinda Paterson (alto) Brenton Spiteri (tenor) and Manfred Pohlenz (bass). In truth, this chorus was in the privileged position to sit back and enjoy the majesty and glory of the work’s first three movements as Beethoven built his musical moods from quietude to majesty, slow rhythms to glorious brass fanfares using only the orchestra. Each movement was beautiful and complete in its own right, but all lead to the work’s ultimate, majestic finale. That was when chorus, soloists and orchestra came together to deliver the most magnificent Ode To Joy that I’m sure Geelong has ever heard. It was spine-tingling stuff, and rightly drew that standing ovation. Every musician, singer and performer involved can stand proud having created such a beautiful concert. And Geelong can stand proud, too, for nurturing an orchestra capable of presenting such musical perfection. 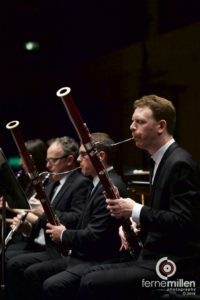 It’s GSO’s policy, and its practice, to present challenging as well as popular works, whilst opening its players to the experience of guest conductors. All three of these occurred with this event, and the outcome was an outstanding concert of pride and rare beauty. 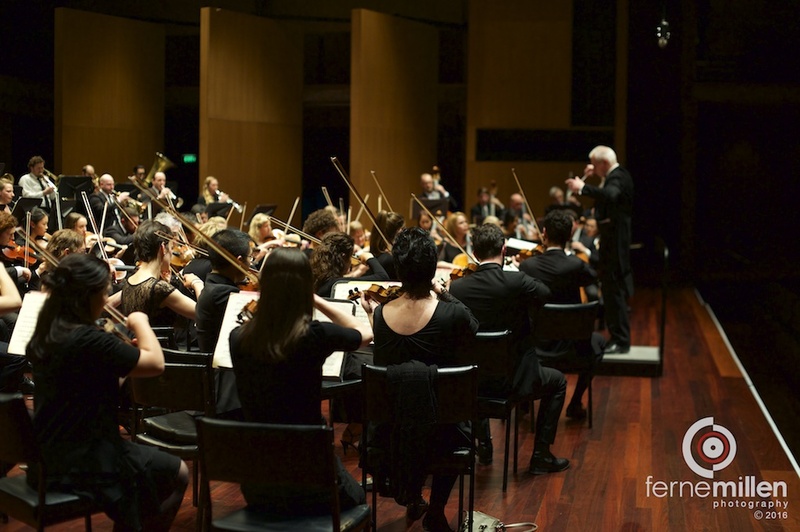 The pride was in the quality of Geelong’s still-fledgling symphony orchestra. It’s sometimes difficult to comprehend that this is only the GSO’s third year, for it now plays with the confidence and maturity of an established musical institution. As for the beauty, that came from the choice of programme, which was Spanish themed. This Spanish Fire began with the smouldering passion of Juan Crisóstomo Arriaga’s Symphony in D Major, which is a difficult, challenging piece of rich, complex musical patterns and textures amid smooth calming passages that was presented by our orchestra with accomplished ease. Then followed the jaunty flickering of Manuel de Falla’s equally testing Suite from the Three Cornered Hat, also completed with verve. Following an interval, the flames intensified when solo guitarist Matt Withers joined in. Matt and the orchestra presented the Basque composer Joaquin Rodrigo’s Concierto de Aranjuez with its well-known second Adagio and equally popular third movement Allegro Gentille. For this reviewer those pieces evoked images not of Spanish plains but of American films, because snippets have been used so many times by Hollywood to evoke the barren western desert atmosphere. So the opportunity to hear the pieces in their full splendor and correct concepts was appreciated. The long, loud applause drew what was officially an encore piece – though it was listed in the programme, and its composer was in the audience – of James Mountain’s Spanish Romance for Guitar and Orchestra, a lush and sumptuous work of musical romance that was equally well received – before Matt left and the Orchestra took on another popular piece in Enrique Granados’ Intermezzo from Goyescas. And finally, stoked and enhanced by the addition of extra brass and percussion players, the orchestra finished the evening with a blazing rendition of Emmanuel Chabrier’s best-known work, the catchy and popular España. That was the structure of the evening. But what made this concert exceptional was not only the high quality of all round performance, but the input of guest conductor Warwick Stendgårds. He’s a slim, middle-aged neatly turned out man who appeared to have energy and vitality to spare. He looked a little like former premier John Brumby – but this was a John Brumby primed on red cordial. Because Warwick Stendgårds conducts with a sort of all-encompassing ‘restrained spectacular’ style, his body swaying with the musical rhythms, his left hand flourishing wide circles while the right wields his baton like a sabre, sometimes stabbing the air, sometimes broadly sweeping but always demanding attention. All this was augmented with little nods, smiles and gestures toward his orchestra – and sometimes, to the audience, too. I’m quite sure that this was a warm learning experience for our orchestra’s younger players, for they responded, literally with gusto. Geelong’s premier Orchestra displayed its impressive development with this accomplished concert of challenging, lyrical and fascinating pieces. It was under the baton of energetic guest conductor, Brett Kelly, who, with the minimum of audience contact, still managed to convey an air of an unpretentious maestro with a pride in his orchestra. This came across strongly in the opening piece, Khatchaturian’s Adagio from Spartacus, a work familiar from its TV appearances, especially as the lyrical, background to those magnificent tall ships on The Onedin Line. But here it was, in all of its smooth, soaring majesty being faultlessly presented by our own 60- piece orchestra. 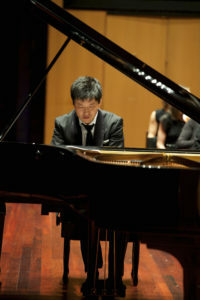 It was Rachmaninov’s Rhapsody on a Theme from Paganini – some 20 minutes of gloriously changing musical textures, patterns and colours, some familiar, some spiky, others lush and lyrical, all delivered by another self-effacing master musician, guest pianist Hoang Pham, with the orchestra taking very much a support role. Young, slim, immaculate in appearance as well as presentation, Mr Pham played the complicated pieces with elegance and elan – and completely from memory, without a single sheet of music on the Costa Steinway. brilliant showpiece that brought another storm of applause continuing long after he had left the stage, until he was to return again, take his seat and deliver another, quite different musical delight, before the pattern repeated, drawing yet a third impromptu solo. After that sparkling celebration, and a short interval to recover, the orchestra returned to present the concert’s main event, Tchaikovsky’s 6th Symphony (Pathetique) Op. 74 B Minor. This emotional piece, written just weeks before the composer’s death, contains moods that lift from lyrical contentment to the depths of despair as he raged against his inevitable end. It’s a moving, challenging piece that was delivered by our orchestra with sensitivity, feeling – and an overarching air of professional competence. Because by taking on such a challenging programme, then delivering it with immaculate skill and style, the Geelong Symphony was musically announcing that it had arrived as a significant entity on the Victorian musical scene. It was received with that long and sustained applause – but this time no modestly flamboyant encores. And it was evident from the audience mood in the after-concert foyer that Geelong can today stand with immense pride behind its impressive, fully-fledged fully professional symphony orchestra. Bravo! (delivered standing). Music by: Borodin, Elgar, Bizet, Handel, Williams, etc. Proms choruses – Jerusalem, Land of Hope and Glory, and others. With the programme title ‘A Night in Vienna’, those who stayed away thinking they would hear only Strauss waltzes missed a treat. The music was by Mozart and Beethoven, who both chose to make their homes in that most cultured of cities, as did other legendary musicians including Haydn and Schubert at different times. 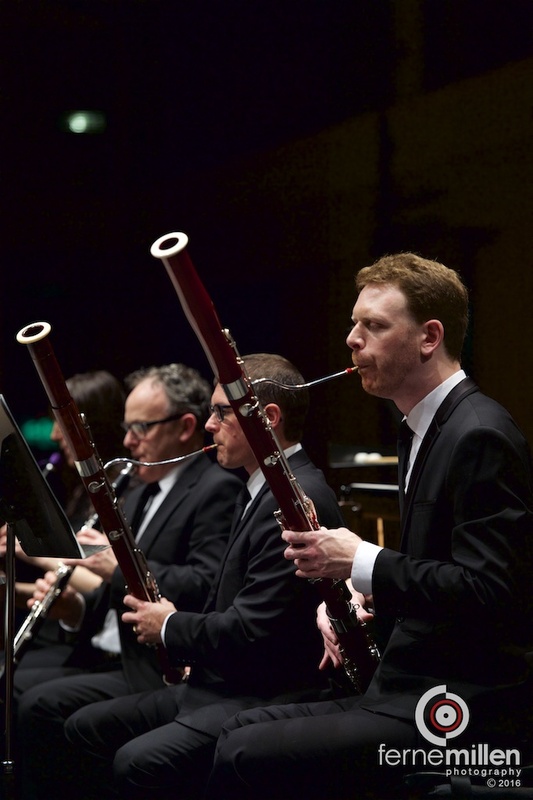 This was followed by the 3 movements of Mozart’s masterpiece, the extraordinary Clarinet Concerto in A Major, featuring Frank Celata, lecturer at Sydney Conservatorium, on clarinet. His flawless playing, with particularly warm and colourful notes in the woody lower register, was well- supported by the strings and other woodwinds in subtlety and shading. The lyricism, and also the playfulness of Mozart’s writing were beautifully brought out with fine phrasing, and the delicate interplay between soloist and orchestra was a delight to experience. Beethoven’s Symphony no. 7, written between 1811 and 1812, was the most recent work of the three, and the audience in Costa Hall was reminded why it was that the composer regarded it as one of his best works. The vitality of this work was conveyed well from the outset, along with the beauty of the second movement, the rollicking scherzo, and the frenzied, relentless energy of the finale. It features lively dance-like rhythms, repeated figures, sudden changes of dynamics and tempi. The energy of this performance, and the role of the timpanist in particular, was entrancing. It’s content – emotional, lyrical music chosen from composers born in Russia, the Czech Republic and Finland – was both challenging and reassuring. The challenge was to recreate the musical colours, moods and patterns describing northern Europe in the 19th and early 20th centuries with a recently formed group of mostly young 21st Century passionate Australian musicians. Mussorgsky, Dvorak and Sibelius wrote their scores for performance by full-time professional musicians with time to ponder and practice distraction-free for weeks, sometimes months beforehand. In contrast, the Geelong Symphony had but a handful of rehearsals with its guest conductor Brett Kelly, some of them missing players as a result of our hectic comparative lifestyles. With this in mind, just completing the programme could be considered an achievement for any orchestra. But to do so with such accomplished ease and skill was impressive – and very reassuring. Because this Geelong orchestra, launched last year on a wave of warm anticipation, was displaying an ability to handle a difficult, complex programme outside the expected popular norm. 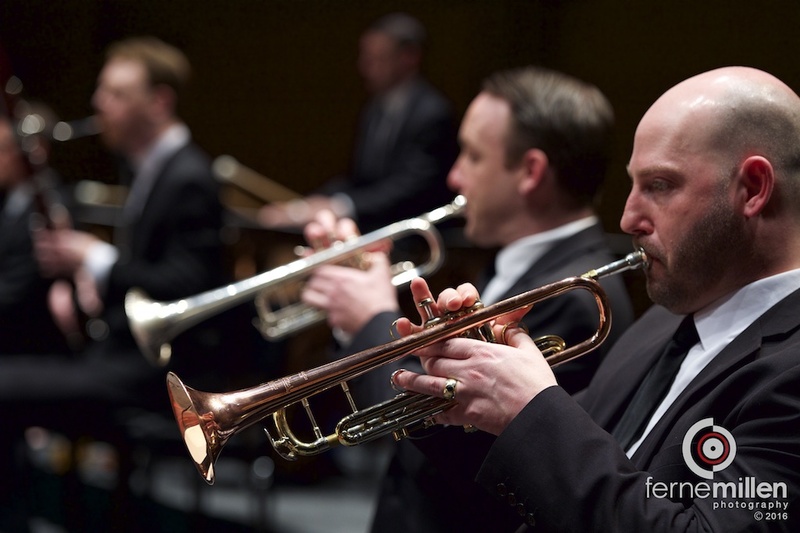 It thrilled with the opening piece – Mussorgsky’s Night on Bald Mountain – with its large, lyrical string section holding musical dialogues with its lusty augmented brass players, all neatly contrasted by lyrical harmonies from the woodwind and delicate gentle elaborations from the flutes. It then played with tactful, refined restraint to allow the evening’s accomplished guest soloist Michael Dahlenburg to display his passion and skills – he has a glorious abundance of both – in performing Dvorak’s Cello Concerto in B minor, while the orchestra provided a neat and lovely supporting musical framework from those strings and predominant horns. Following an interval came the compelling, repetitive patterns of Sibelius’ Symphony No 2 in E minor. This piece had stirring anthems and challenging rhythms, textures and colours – all inside recurring patterns and all executed with aplomb and no mean skill by an orchestra that appeared to have grown in stature throughout the evening. It was reassuring, too, to hear the appreciation from an audience of healthy numbers considering the concert’s comparative lack of big-name drawing power. It will be interesting to see the crowd at the Geelong Symphony’s next Costa Hall showing, in August, when our orchestra performs a couple of big names – Mozart and Beethoven – in a concert titled A Night In Vienna. This promises to be a concert of rare pride for Geelong – and an event not to be missed. Geelong wins from an evening of Russian passion. This concert consisted entirely of the works of Pyotr Tchaikovsky. It began with his Polonaise Act III Eugene Onegin; then moved on to the three movements of his Violin Concerto in D Major Op. 35, with soloist Rebecca Chan. Following a short interval, the orchestra played all four movements of his Symphony No. 5 in E Minor Op. 64. To say the works were well received would be an understatement. The interval had been shortened by the long and sustained applause for soloist Rebecca’s three curtain calls, while the last note of the Finale movement brought on an instant burst of applause that lasted a full four minutes with calls of ‘Bravo’ and conductor Joannes Roose three times standing his orchestra to accept their acclaim. It was a heartwarming response, and quite amazing, considering that this orchestra held its first concert only in February this year. That applause, from a healthy 1000-strong Costa Hall audience, cemented the GSO’s position as a fully-emerged identity in the State’s classical music arena. It signaled that no longer need our city’s classical music fans take the highway to Melbourne, or await the MSO’s visits for we now have a high-standard orchestra of our own. So stand tall GSO founders Wendy Galloway, Jon Mamonski, Prof Jane den Hollander, maestro Roose and leader Ben Castle, for your work has given the people of Geelong a reason for pride in our city’s culture. This was a concert chosen to build a following; the works were well-known and popular; the soloist glamorous. And the orchestra had been reshaped from that initial February group with extra strings to bring the warm, emotional lyrical sounds of Tchaikovsky’s Russia. The opening Eugene Onegin movement set the scene perfectly with its soaring, dramatic, lyrical themes executed with care and precision. But then came the stunning soloist Rebecca Chan, glamorous in a flame-red full-length dress against our orchestra’s colour-restrained black dresses and business suits. She sounded (literally) brilliant with a rendition of clarity, verve – and sympathy – in interpreting the moods and emotions of Tchaikovsky’s works. And she captured every heart in the Hall, too, with her eyes-closed, enraptured, almost-dancing-on-the-spot extension of the music into interpretive movement. She delivered all three, very different and technically difficult moods of the work in this compelling style, entirely from memory. A full thirty-five minutes, drawing the fore-mentioned sustained applause and preparing the audience for its full-symphony second half. This was delivered with all the care, precision, skill of the opening piece, but with an extra, almost tangible confidence that came as a result of that interval-encroaching applause and a growing positive audience vibe. The concert’s programme listed GSO’s planned next three Costa Hall concerts in 2017. Each is of popular works and all are designed to build on the successes of this year. They’re listed in full on this site’s ‘Hot News’ page. I recommend that you book for these now, not only to gain the generous early-booking rates, but to take the opportunity to experience a first-rate orchestra and experience first-hand a newly-minted first-class asset to our region. While Kristian played Rachmaninov’s 2nd Piano Concerto at the GSO Concert, he’s playing the final of Rach 3 in this video. The foyer anticipation was palpable – there were so many people wishing Geelong’s new orchestra well; wanting them to shine. Talk was of the beginning of a new era in our city’s cultural identity – a step towards our coming of age as a mature society. Inside the hall, that atmosphere intensified, fuelled, somewhat contradictorily, by a complete lack of hype or fanfare. The venue was almost full – more than 1,000 tickets sold. The house lights were not dimmed amid polite applause which rose in volume when conductor Joannes Roose joined them, smiled briefly at the audience, then raised his baton. The first note of Nicolai’s Overture to the Merry Wives of Windsor was exquisite – pure, clear, singular and swelling to beautiful clarity. Inside the first stanza, indeed, the first minute, the feelings from the audience were almost audible, too, containing relief, awe, respect – and justification. This was truly an excellent orchestra, worthy of its venue and our city – and its quality upheld all the pre-concert expectations. So the applause was warm and long. Then came a brief interlude while stage hands wrestled the venue’s Steinway grand piano to centre stage for the evening’s soloist, Kristian Chong. He entered, young, casual, smiling, sat at the piano, adjusted his surroundings – then produced a brilliant, flawless rendition of Rachmaninoff’s demanding piano concerto 2 in C minor Opus 18, neatly, competently and unobtrusively backed by the orchestra. This outstanding effort drew more sustained, even warmer applause. Following the interval, the audience returned vitalised, having discussed their new City orchestra’s quality. They were treated to an accomplished version of Dvorak’s New World Symphony delivered in the highly competent manner. The work was an excellent choice; its contrasts, crescendos and familiar recurring themes formed an ideal showcase to introduce a new orchestra to its new audience. And it was appreciated, drawing an almost reverential standing ovation, with any doubters in the audience now fully won over. Its next concert in the Costa Hall is October 28, with a Russian musical Spectacular. And that’s surely enough notice to be seen championing such an excellent group of Geelong musicians.